New ventures are exciting at any age, and we understand this is a big step. Our Decision Guide provides helpful questions and answers for future residents and their families. Will I have a voice as a resident? Absolutely! Butterfield has an active Resident Council through which residents can provide feedback and voice opinions and concerns. The council is comprised of residents who are elected by peers and meet each month. The council is an active, integral part of the Village and is instrumental in working with leadership on many facets of campus life. Butterfield also hosts monthly Town Hall meetings. In addition, the BTV bylaws also provide that up to two residents shall serve on the Butterfield Board of Directors. What are some of the benefits of becoming a resident of Butterfield Trail Village? There are many reasons to choose Butterfield Trail Village, Northwest Arkansas’ premier active-living, Life Plan retirement community. They include the practicality of downsizing; freedom from the responsibility of home maintenance; the flexibility of being able to travel without worrying about your home’s safety; friendly, interesting neighbors who make you feel at home; and the security and comfort of knowing that should you ever need long-term skilled nursing care, it is available onsite. What other benefits come from living at Butterfield? As a Village resident, you can expect a comfortable, rewarding lifestyle with endless opportunities for socializing, entertainment, spiritual enrichment, health and wellness and lifelong learning – plus the freedom to do a much or a little as you like. You’ll join a community of 400 residents and more than 200 staff members who are skilled and caring professionals, ready to serve. A multi-million dollar Wellness & Aquatic Center and a professional fitness staff provide a myriad of fitness options at your fingertips, while our programs and events team offers entertainment options and activities for every taste and preference. Some of the onsite amenities you’ll enjoy at Butterfield include housekeeping, flat laundry service, beautifully maintained grounds and convenient scheduled transportation. The campus also has round-the-clock security and 24-hour maintenance. Butterfield is conveniently located in Fayetteville in the dynamic region of Northwest Arkansas. Fayetteville is home to the University of Arkansas and is regularly ranked as one of the best cities in the U.S. in which to live and retire. Northwest Arkansas is also ranked as one of the most affordable, safe and overall best regions in the nation. Should my decision to move to Butterfield involve my family? It goes without saying – moving from your present home to a retirement community is a big decision. In many ways, it’s a family decision that affects not only you, but also your loved ones. That’s why it’s important that your family members are fully on board and support the decision you make. Talk it over with your family. Discuss candidly the primary reasons why you are considering a move (e.g. health concerns, trouble maintaining your house or yard and/or a desire for friends and companionship). Your transition will be made easier by ensuring your family’s questions are answered, and they are well informed. Bring them on a tour of Butterfield Trail Village. Let them meet our staff members and other residents to hear first-hand how supportive everyone is and how satisfied current residents are. Above all, remember that your children and other family members love and care about you. Your happiness and wellbeing are their utmost concerns. When they see you are confident about your future, they will be confident, too. For those of retirement age, financial preservation is of the utmost importance. Residents have a right to expect that the community they choose is governed and operated in a manner that allows it to remain financially sound and meet its long-term commitments to residents. At Butterfield, we are proud of our long history of providing residents with superior quality care in a financially sustainable manner. The state of the Village is strong. It is our pleasure to provide the financial information and explanations you need to fully understand the financial condition of our organization. Examples of such information includes audited financial statements, accreditation information, and information about reserves and financial forecasts. At Butterfield, we follow established industry standards for full financial disclosure concerning our operations. These best practices are established by the American Association of Homes and Services for the Aging, and the American Seniors Housing Association. How can I contact Butterfield? We’re ready to help you as you discuss future living options with your children or other loved ones. We have detailed information and access to what may the best resource of all – residents who have already made the decision and are very happy with the outcome. Call us at (479) 695-8012 and let us take you on a tour and answer all your questions. It will be our pleasure to be your host for a complimentary overnight stay. How do I know if my parent or family member is ready to transition to a retirement community? Often, you’re in the best position to know when your parent is ready to transition to a retirement community. You may often see signs: Mom is maybe feeling lonely. Dad has become more forgetful. Meals are more of a problem, or home maintenance is becoming too much of a burden. Worry for your loved one’s safety and wellbeing has become top of mind. These are some of the signs, and they usually become more pronounced over time. Eventually, single, isolated problems are multiplied, making living conditions more complex and worrisome. Often what is needed is a direct, heart-to-heart talk to point out your concerns and discuss possible solutions. As with everything else you do, this is a conversation grounded in love and sensitivity and a genuine concern for your parent’s wellbeing. You should know that this is a common scenario, one that every child with an aging parent faces at one time or another. You’re not alone, and the staff at Butterfield Trail Village is here to help you every step of the way. How do I ensure that our family is making the right choice? The first thing we recommend is that you visit Butterfield Trail Village and talk with our residents. This will give you tremendous insight into Butterfield as a vibrant, thriving community and will help give you the high level of confidence you need to ensure that Butterfield is indeed the right choice. What kind of health care is provided at Butterfield? Butterfield Trail Village is a Life Plan retirement community, offering a full continuum of health and medical care. Residents can enjoy as much or a little freedom as they want and live an independent lifestyle for as long as they are able. If a resident finds they are in need of long- or short- term skilled nursing, Butterfield’s Health Care and Special Care centers, which continually receive the highest rankings possible, are located onsite and available only to BTV residents. For many people this is the deciding factor in choosing Butterfield. The comfort and security of knowing that should your loved one or his or her spouse ever needs rehabilitative services or skilled nursing care, it is available onsite. At Butterfield, your parent’s needs may change, but their address won’t. Is Butterfield safe, and is there security onsite? Butterfield Trail Village provides a 24-hour security staff and emergency call and response systems. Our Apartments, Cottages and Village Homes have fire and smoke detectors and central security systems with handy call buttons to ensure the wellbeing of every resident. How do I know if Butterfield is a smart financial decision for my parent or loved one? Across the country, retirement community residents, their families and industry experts overwhelmingly agree that Life Plan communities, such as Butterfield Trail Village, provide the greatest financial security, value and peace of mind for residents and their families. As a relative, you have right to expect that Butterfield is governed in a manner that allows the organization to remain financially sound and meet its long term commitments to residents. At Butterfield, we are proud of a long history of providing residents with superior quality care in a financially sustainable manner. Rest assured, the state of the Village is strong. It is our pleasure to provide you with the financial information and explanations you need to allow you to fully understand the financial condition of our organization. Examples of such information includes audited financial statements, accreditation information, and information about reserves and financial forecasts. At Butterfield, we follow established industry standards for full financial disclosure concerning our operations. These Best Practices are established by the American Association of Homes and Services for the Aging and the American Seniors Housing Association. We’re ready to help you as you discuss future living options with your parents or loved ones. We have detailed information and access to what may the best resource of all – residents who have already made the decision and are very happy with the outcome. What precisely is Butterfield Trail Village? Butterfield Trail Village is a non-profit Life Plan Community (formally known as a Continuing Care Retirement Community or CCRC) offering a full array of lifestyle amenities for its residents. Included in this community residential setting, independent living residents have access to assisted living, memory care and skilled nursing all on the same Village campus. Residents at BTV have a Life Care Type A contract. Type A Life Care refers to a contractual agreement where residents have purchased the use of the services at Butterfield for the rest of their lives. There is a one-time entry fee and a monthly fee associated with the type of independent living unit requested for residency. Type A contracts protect the resident(s) in that they will not be asked to leave Butterfield for health or financial reasons. Tax law is ever changing and BTV will not provide tax advice. BTV will provide a statement upon request to residents for medical expense deductions that may be shared with a tax preparer. Is the Entry Fee refundable? There are three entry fee options at Butterfield. The first is the basic entry fee that comes with a 12-month satisfaction guarantee and has a declining balance that is refundable if the resident moves out in the first 5 years. After the fifth year, it is not refundable. Death does not apply. There are two refundable plans — 50% and 75% — for applicants age 85 or less at time of contract. At any time a resident moves out or passes away either 50% or 75% is refunded to the resident’s estate. Is the Monthly Service Fee subject to change? Yes, the monthly service fee has historically been adjusted annually. Residents will be notified of the change 30 days prior to implementation. This adjustment is made to maintain the high level of operation and services at the Village. Is there a minimum age or a maximum age to become a resident? Residents must be 62 years of age or enter into the contract with someone 62 or older. The younger resident will not have use of the assisted living, memory care or skilled nursing services until they reach the age of 62. There is not a maximum age. What is the Physician’s Assessment? When a future resident has accepted an apartment, cottage or village home at BTV, then they must pass a Physician’s Assessment (PA). The Physician’s Assessment is conducted in two parts. A form is provided for the future resident’s medical doctor to fill out and return to Butterfield. Then the future resident will meet with a Licensed Social Worker (LSW) and Registered Nurse (RN) to determine that the future resident is living independently. This must be done within 90 days of signing the Life Care Contract. Apartments are assigned a cube within the tenant storage closet on their hall. It is numbered by the same number as the apartment. There is also a storage closet on every patio and balcony of every apartment. Cottages have a storage closet at the front of their carports and a few cottages have attic spaces. Village Homes have shelving along the interior of the garages and some attic space. Do you have a guest suite on campus? Yes, it is a studio apartment in the main building. Residents may reserve the suite through the Marketing Department. There is a $75 per night charge, which is billed directly to the resident’s statement. 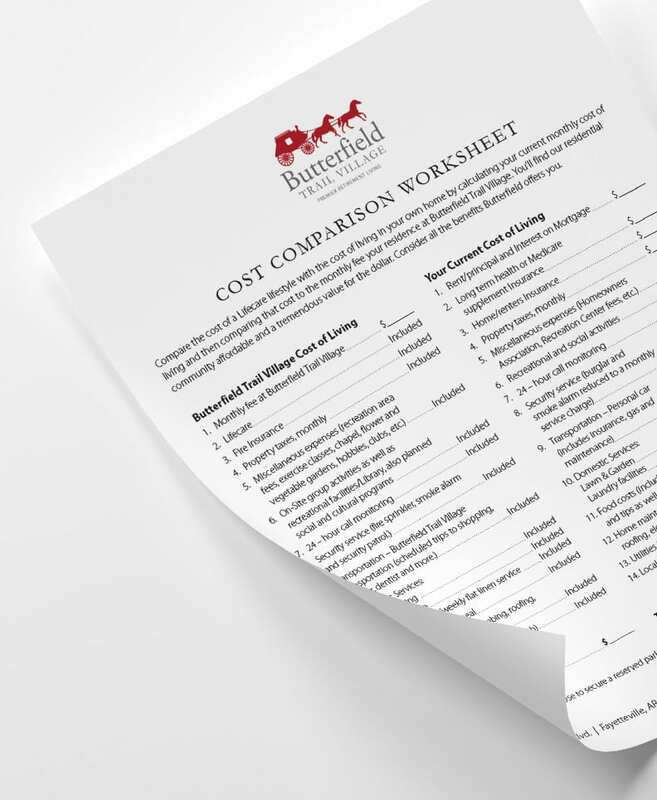 Our Value Chart will help you compare the cost of a Life Plan community with the cost of living in your own home. You’ll find that Butterfield is not only relatively affordable, but a tremendous value for the dollar. We are ready to help as you or your loved ones consider future options. Please call us at (479) 695-8012.